This might at first appear to be a duplication of a review I posted in the last update (Marsyas 170423), but actually I am here dealing with the DVD version of While Good Folk Sleep. In my earlier notice observations about both the music and performances were positive, and I found that three collections of short pieces – Images, States of Mind, and The Black Cat Suite – were among the stronger offerings on the CD. Also, I found the Toccata of great interest, and most of the other works as well, including the four pieces comprising the title work, While Good Folk Sleep. 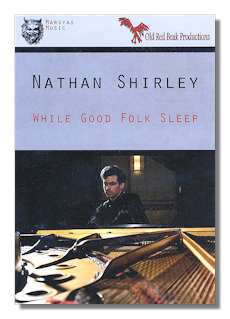 My views on the music and performances remain unchanged in assessing the DVD release, but let me add that the listener can now see the fairly high level of difficulty in the music and how splendidly it is played by the composer Nathan Shirley. Again, the sound is fine but, more importantly, the camera work is utterly splendid. You see the pianist from all angles: overhead, from the right or left side, or from behind the piano. And the shots are not randomly chosen but always intelligently integrated into the performance. If you are interested in sampling the music of this imaginative and fairly conservative composer and are weighing purchase of either the CD or DVD, I would strongly recommend the DVD. With it, you also get several bonus tracks, the first of which features the four pieces comprising the collection, While Good Folk Sleep, played as background music to several cartoon-like animated sequences. The figures in the animations are cardboard-like cut-outs, not unlike those in Monty Python's Flying Circus. But, be assured, there's nothing humorous about these ethereal, rather spooky creations. There are also tracks that feature Shirley playing an alternate version of Mirrors, as well as Ballade, a work contrasting a lovely but forlorn main theme with agitated and intense music. Actually, I believe I would rank Shirley's Ballade among his finest works here. Highly recommended!